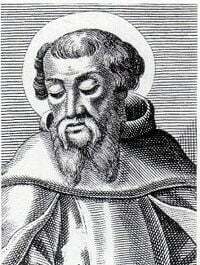 Irenaeus (Greek: Εἰρηναῖος), (c. 120- c. 200) was a notable early Christian apologist and bishop of Lugdunum in Gaul, which is now Lyon, France. His writings were formative in the development of early Christian theology, and he is recognized as a saint by both the Eastern Orthodox Church and the Roman Catholic Church. He is additionally considered to be a distinguished Father of the Church. The most famous writing attributed to Irenaeus is Adversus Haereses ("Against Heresies"), in which he combated the heresy of Gnosticism. His works contain strong denunciations of rival theological positions that were deemed to be contrary to emergent Christian orthodoxy. His writings also contain one of the earliest lists of the biblical canon that includes the four gospels, which became part of the New Testament today. Irenaeus' feast day is celebrated on June 28 in the Latin Church, and on August 23 in Greek Orthodoxy. Born in the first half of the second century (his exact dates are disputed), Irenaeus is thought to have been a Greek from Polycarp's hometown of Smyrna in Asia Minor, now İzmir, Turkey. Unlike many of his contemporary Christians, he was raised in a Christian family rather than converting as an adult. During the persecution by the Roman Emperor Marcus Aurelius (second century C.E. ), Irenaeus was a priest of the Church of Lyon. The clergy of that city, many of whom were suffering imprisonment for the faith, sent him (in 177 or 178) to Rome with a letter to Pope Eleuterus concerning the heresy Montanism, and that occasion bore emphatic testimony to his merits. Returning to Gaul, Irenaeus succeeded the martyr Saint Pothinus and became the second Bishop of Lyon. During the religious peace that followed the persecution by Marcus Aurelius, the new bishop divided his activities between the duties of a pastor and of a missionary. Almost all his writings were directed against Gnosticism, an off-shoot from Christianity which was spreading at the expense of what he considered to be Christian orthodoxy. The most famous of these writings is Adversus Haereses (Against Heresies). In 190 or 191, he interceded with Pope Victor I to lift the sentence of excommunication laid by that pontiff upon the Christian communities of Asia Minor which persevered in the practice of the Quartodeciman celebration of Easter. Nothing is known of the date of his death, which must have occurred at the end of the second or the beginning of the third century. In spite of some isolated and later testimony to that effect, it is not very probable that he ended his career with martyrdom. He was buried under the church of Saint John's in Lyon, which was later renamed St. Irenaeus in his honour; the tomb and his remains were destroyed in 1562 by the Calvinist Huguenots. Irenaeus wrote a number of books, but the most important that survives is the five-volume On the Detection and Overthrow of the So-Called Gnosis, normally referred to by the Latin title Adversus Haereses ("Against Heresies"). Book I talks about the Valentinian Gnostics and their predecessors, who go as far back as the magician Simon Magus. Book II provides rational proof that Valentinianism contains no merit in terms of its doctrines. Book III shows that these doctrines are false by providing evidence from the Gospels. Book IV consists of Jesus' sayings, and stresses the unity of the Old Testament and the Gospel. The final volume, Book V, focuses on more sayings of Jesus plus the letters of Saint Paul the Apostle. The purpose of Against Heresies was to refute the teachings of various Gnostic groups; apparently, several Greek merchants had begun an oratorial campaign praising the pursuit of gnosis in Irenaeus' bishopric. Until the discovery of the Library of Nag Hammadi in 1945, Against Heresies was the best-surviving description of Gnosticism. According to most biblical scholars, the findings at Nag Hammadi have shown Irenaeus' description of Gnosticism to be largely inaccurate and polemic in nature. Though correct in some details about the belief systems of various groups, Irenaeus's main purpose was to warn Christians against Gnosticism, rather than accurately describe those beliefs. He described Gnostic groups as sexual libertines, for example, when their own writings advocated chastity more strongly than did orthodox texts. Irenaeus also wrote The Demonstration of the Apostolic Teaching, an Armenian copy of which was discovered in 1907. This work seems to have been an instruction for recent Christian converts. Various fragments of other works by Irenaeus have been found, and many lost works by him are attested by other ancient writers. These include On the Subject of Knowledge, On the Monarchy, or How God is not the Cause of Evil, On the Ogdoad, an untitled letter to Blastus regarding schism, and others. All these works are attested by Eusebius. Irenaeus' works were first published in English in 1885 in the Ante-Nicene Fathers collection. The central point of Irenaeus' theology is the unity of God, in opposition to the Gnostics' division of God into a number of divine "Aeons," and their distinction between the utterly transcendent "High God" and the inferior "Demiurge" who created the world. Irenaeus uses the Logos theology he inherited from Justin Martyr. Irenaeus was a student of Saint Polycarp, who was said to have been tutored by John the Apostle. John used Logos theology in the Gospel of John and book of 1 John. He prefers to speak of the Son and the Spirit as the "hands of God." His emphasis on the unity of God is reflected in his corresponding emphasis on the unity of salvation history. Irenaeus repeatedly insists that God began the world and has been overseeing it ever since this creative act; everything that has happened is part of his plan for humanity. The essence of this plan is a process of maturation: Irenaeus believes that humanity was created immature, and God intended his creatures to take a long time to grow into or assume the divine likeness. Thus, Adam and Eve were created as children. Their Fall was thus not a full-blown rebellion but rather a childish spat, a desire to grow up before their time and have everything with immediacy. According to Irenaeus, the high point in salvation history is the advent of Jesus. Irenaeus believed that Christ would always have been sent, even if humanity had never sinned; but the fact that they did sin determines his role as a savior. He sees Christ as the new Adam, who systematically undoes what Adam did: thus, where Adam was disobedient concerning God's edict concerning the fruit of the Tree of Knowledge, Christ was obedient even to death on the wood of a tree. Irenaeus is the first to draw comparisons between Eve and Mary, contrasting the faithlessness of the former with the faithfulness of the latter. In addition to reversing the wrongs done by Adam, Irenaeus thinks of Christ as "recapitulating" or "summing up" human life. This means that Christ goes through every stage of human life, from infancy to old age, and simply by living it, sanctifies it with his divinity. Irenaeus argues that Christ did not die until he was older than conventionally portrayed. Irenaeus conceives of our salvation as essentially coming about through the incarnation of God as a man. He characterizes the penalty for sin as death and corruption. God, however, is immortal and incorruptible, and simply by becoming united to human nature in Christ he conveys those qualities to us: they spread, as it were, like a benign infection. Irenaeus therefore understands the atonement of Christ as happening through his incarnation rather than his crucifixion, although the latter event is an integral part of the former. In his criticism of Gnosticism, Irenaeus made reference to a Gnostic gospel which portrayed Judas in a positive light, as having acted in accordance with Jesus's instructions. The recently discovered Gospel of Judas dates close to the period when Irenaeus lived (late second century), and scholars typically regard this work as one of many Gnostic texts, showing one of many varieties of Gnostic beliefs of the period. Irenaeus shows the close relationship between the predicted events of Daniel 2 and 7. Rome, the fourth prophetic kingdom, would end in a tenfold partition. The ten divisions of the empire are the "ten horns" of Daniel 7 and the "ten horns" in Revelation 17. A "little horn," which is to supplant three of Rome's ten divisions, is also the still future "eighth" in Revelation. Irenaeus climaxes with the destruction of all kingdoms at the Second Advent, when Christ, the prophesied "stone," cut out of the mountain without hands, smites the image after Rome’s division. Irenaeus identified the Antichrist, another name of the apostate Man of Sin, with Daniel's Little Horn and John's Beast of Revelation 13. He sought to apply other expressions to Antichrist, such as "the abomination of desolation," mentioned by Christ (Matt. 24:15) and the "king of a most fierce countenance," in Gabriel's explanation of the Little Horn of Daniel 8. But he is not very clear how "the sacrifice and the libation shall be taken away" during the "half-week," or three and one-half years of Antichrist's reign. Under the notion that the Antichrist, as a single individual, might be of Jewish origin, he fancies that the mention of "Dan," in Jeremiah 8:16, and the omission of that name from those tribes listed in Revelation 7, might indicate Antichrist's tribe. This surmise became the foundation of a series of subsequent interpretations by others. They are identified as the second half of the "one week" of Daniel 9. Irenaeus says nothing of the seventy weeks; we do not know whether he placed the “one week” at the end of the seventy or whether he had a gap. Although Irenaeus did speculate upon two names to symbolize this mystical number, namely Teitian and Latienios, nevertheless he was content to believe that the Antichrist would arise some time in the future after the fall of Rome and then the meaning of the number would be revealed. Irenaeus declares that the Antichrist's future three-and-a-half-year reign, when he sits in the temple at Jerusalem, will be terminated by the second advent, with the resurrection of the just, the destruction for the wicked, and the millennial reign of the righteous. The general resurrection and the judgment follow the descent of the New Jerusalem at the end of the millennial kingdom. Irenaeus calls those "heretics" who maintain that the saved are immediately glorified in the kingdom to come after death, before their resurrection. He claims that the millennial kingdom and the resurrection are actualities, not allegories, the first resurrection introducing this promised kingdom in which the risen saints are described as ruling over the renewed earth during the millennium, between the two resurrections. In common with many of the Church Fathers, Irenaeus did not distinguish between the new earth re-created in its eternal state—the thousand years of Revelation 20—when the saints are with Christ after His second advent, and the Jewish traditions of the Messianic kingdom. Hence, he applies Biblical and traditional ideas to his descriptions of this earth during the millennium, throughout the closing chapters of Book 5. This conception of the reign of resurrected and translated saints with Christ on this earth during the millennium-popularly known as chiliasm—was the increasingly prevailing belief of this time. Incipient distortions due to the admixture of current traditions, which figure in the extreme forms of chiliasm, caused a reaction against the earlier interpretations of Bible prophecies. At times his expressions are highly fanciful. He tells, for instance, of a prodigious fertility of this earth during the millennium, after the resurrection of the righteous, "when also the creation, having been renovated and set free, shall fructify with an abundance of all kinds of food." In this connection, he attributes to Christ the saying about the vine with ten thousand branches, and the ear of wheat with ten thousand grains, and so forth, which he quotes from Papias. Irenaeus’ exegesis does not give complete coverage. On the seals, for example, he merely alludes to Christ as the rider on the white horse. He stresses five factors with greater clarity and emphasis than Justin: 1) the literal resurrection of the righteous at the second advent, 2) the millennium bounded by the two resurrections, 3) the Antichrist to come upon the heels of Rome's breakup, 4) the symbolic prophecies of Daniel and the Apocalypse in their relation to the last times, and 5) the kingdom of God to be established by the second advent. ↑ Robert M. Grant, "Irenaeus of Lyons" (Routledge, 1997), 6. ↑ Elaine Pagels, Beyond Belief (Pan Books, 2005), 54. ↑ James M. Robinson, The Nag Hammadi Library (HarperSanFrancisco, 1990), 104. ↑ Elaine Pagels, The Gnostic Gospels (Vintage Books, 1979), 90. ↑ Bart D. Ehrman, Lost Christianities (Oxford University Press, 2005), 121. ↑ 6.0 6.1 Glenn Davis, The Development of the Canon of the New Testament: Irenaeus of Lyons Retrieved August 10, 2008. ↑ Albert Poncelet, The Catholic Encyclopedia vol. VII, St. Irenaeus, 1910. Retrieved August 10, 2008. ↑ D.D. Rev. J. Tixeront, A Handbook of Patrology, Section IV: The Opponents of Heresy in the Second Century, St. Louis, MO, by B. Herder Book Co. 1920. Retrieved August 10, 2008. ↑ Reverend Alexander Roberts, The Ante-Nicene Fathers: The Writings of the Fathers Down to A.D. 325 Volume I - The Apostolic Fathers with Justin Martyr and Irenaeus (Cosimo Classics, 2007). ↑ Raymond E. Brown, An Introduction to the New Testament (Anchor Bible, 1997, ISBN 978-0385247672), 14. Retrieved August 10, 2008. ↑ 11.0 11.1 Brown, p. 368. ↑ Against Heresies Book 5 Chapter 25 Retrieved August 10, 2008. ↑ Against Heresies Book 5 Chapter 26 Retrieved August 10, 2008. ↑ Against Heresies Book 5 Chapter 28 Retrieved August 10, 2008. ↑ Against Heresies Book 5 Chapter 25, sec. 2-4 Retrieved August 10, 2008. ↑ Against Heresies Book 5 Chapter 25, sec. 3 Retrieved August 10, 2008. ↑ Against Heresies Book 5 Chapter 25, sec. 3-4 Retrieved August 10, 2008. ↑ 19.0 19.1 19.2 Against Heresies Book 5 Chapter 30, sec. 4 Retrieved August 10, 2008. ↑ Against Heresies Book 5 Chapter 30, sec. 2 Retrieved August 10, 2008. ↑ Against Heresies Book 5 Chapter 30, sec. 3 Retrieved August 10, 2008. ↑ Against Heresies Book 5 Chapter 35, sec. 1-2 Retrieved August 10, 2008. ↑ Against Heresies Book 5 Chapter 31 Retrieved August 10, 2008. ↑ Against Heresies Book 5 Chapter 35 Retrieved August 10, 2008. ↑ Against Heresies Book 5 Chapter 28, sec. 3 Retrieved August 10, 2008. ↑ Against Heresies Book 5 Chapter 33, sec. 2 Retrieved August 10, 2008. ↑ LeRoy Froom, The Prophetic Faith of our Fathers (Review and Herald Publishing Association), 250-252. ↑ Against Heresies Book 5 Chapter 32, sec. 2 Retrieved August 10, 2008. ↑ Against Heresies Book 5 Chapter 33, sec. 3 Retrieved August 10, 2008. Brown, Raymond E. An Introduction to the New Testament. Anchor Bible, 1997. ISBN 978-0385247672. Critique of Irenaeus, Gnosticism scholar Elaine H. Pagels. This page was last modified on 6 March 2018, at 00:31.